MSI may be best known for producing high-end PC components, but the Taiwanese manufacturer also has a solid track record when it comes to turnkey systems. The firm's gaming laptops have a sizeable fan base, and it's always interesting to see MSI try its hand at desktops, which tend to come in all shapes and sizes. 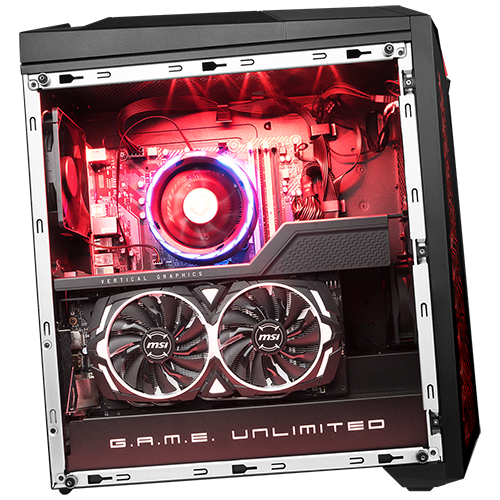 One of the latest off the production line is the Infinite A 8th, a more traditional mid-tower solution designed to show off an array of MSI components and, of course, a good splattering of Mystic Light RGB LEDs. 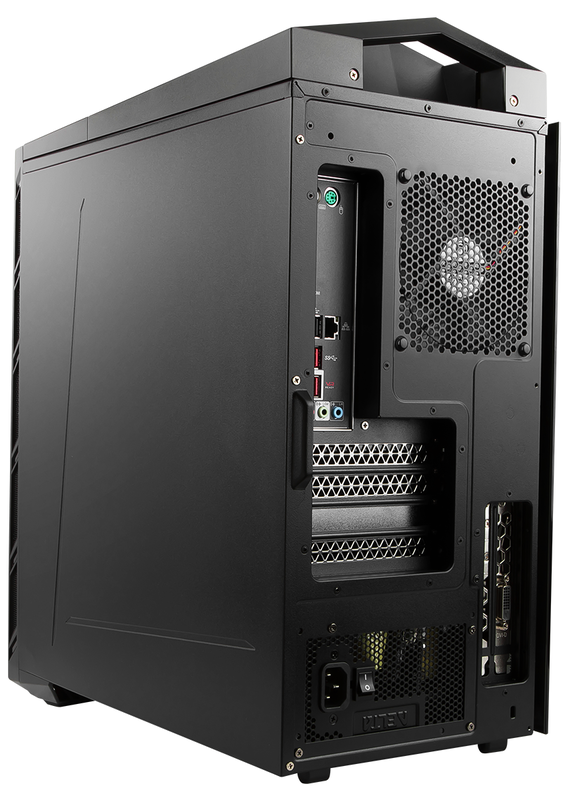 Priced from £999 and available exclusively from Currys PC World, Infinite A 8th is presented in a chassis that, let's face it, you're either going to love or hate. MSI is clearly hoping to turn heads, and for young gamers browsing the often bland in-store desktops, Infinite A 8th will stand out courtesy of a tilted pose, plenty of angles, and an RGB pattern on the front. It's too aggressive for our liking, and the plastic accents give it a cheap feel, though there are some neat features. 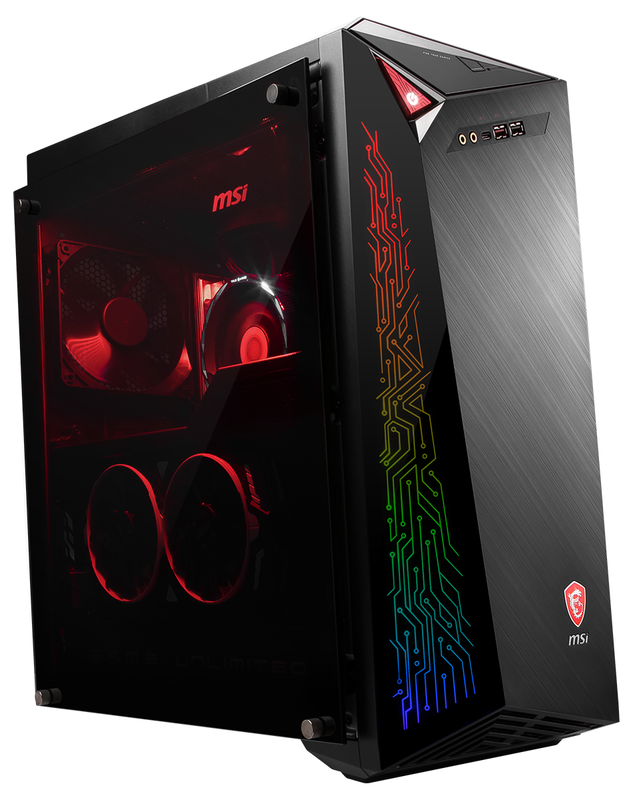 The lighting is well done and easily synchronised with other MSI gear, the front ports include both USB Type-A and Type-C, the power button has the look and feel of an ignition switch, and we quite like the inclusion of an optical drive at the top of the case - far too many mid-towers eject such a feature for the sake of. 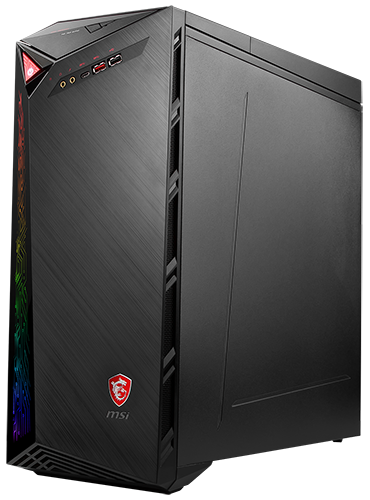 It's also handy that MSI includes a choice of windowed or solid side panels in the box, letting users dress the system as they see fit. 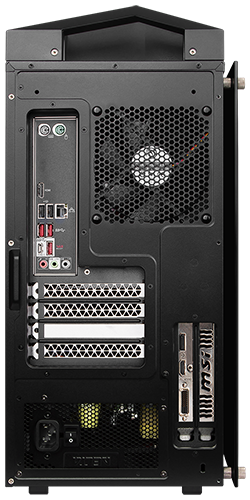 The external design will no doubt divide readers, but most will appreciate the fact that MSI's desktop system measures a reasonably petite 210mm x 450mm x 488mm, and though it tips the scales at 13kg, the carry handle at the top means it isn't too difficult to transport. Infinite A 8th won't be winning many hearts based on looks alone, but it's what's on the inside that counts, right? Well, here's where things get complicated. 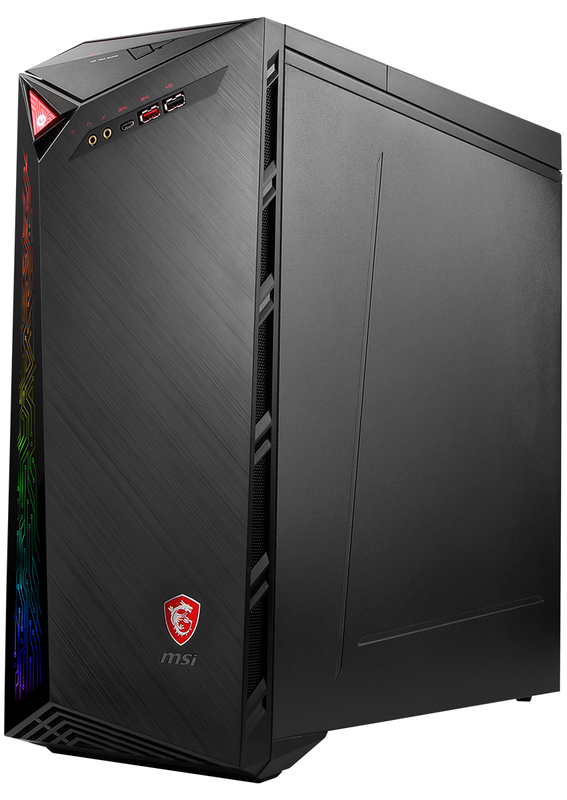 MSI plans to bring at least half-a-dozen SKUs to retail, priced from £999 to £1,899, but some will only be available in-store, and at the time of writing just the entry-level model is available online. 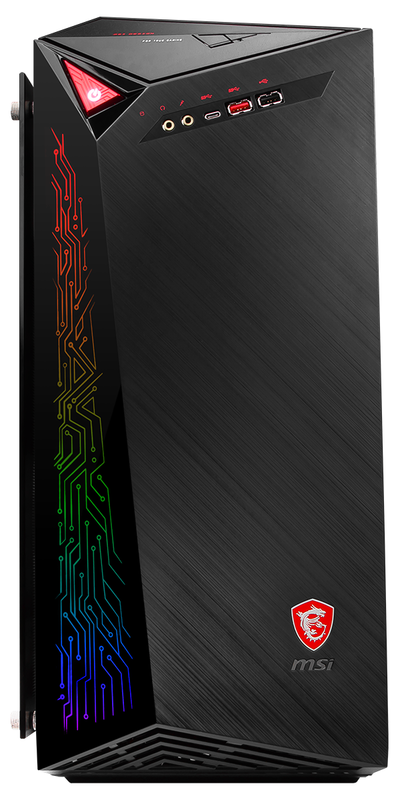 The base specification includes an 8th Gen Intel Core i5-8400 processor, an MSI B360M Bazooka motherboard, 8GB of DDR4 memory, GeForce GTX 1060 6GB graphics and a 2TB hard disk that gets a speed injection courtesy of a 16GB Intel Optane Memory M.2 accelerator. Our £1,399 review sample, which hasn't yet appeared at retail, contains many of the same components, but upgrades the processor to an Intel Core i7-8700, while adding a 128GB 2.5in SSD as the system disk. Hardly seems look like good value for an extra £400, and at this price point there are a few shortcomings that ought to have been avoided. 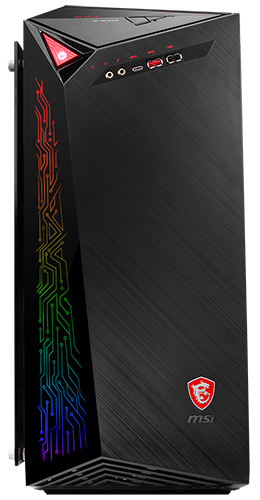 The 8GB of DDR4 memory is provided as a single stick, preventing the bandwidth gains of a dual-channel configuration, and though we like the idea of an Intel Optane cache helping accelerate the secondary hard disk, the primary Transcend SSD230S drive is a basic SATA solution that feels out of place in an 8th Gen Core i7 gaming rig. Rounding out the specification is an Intel Wireless-AC AC3168 adapter for WiFi and Bluetooth duties, plus a 550W 80 Plus Bronze power supply. 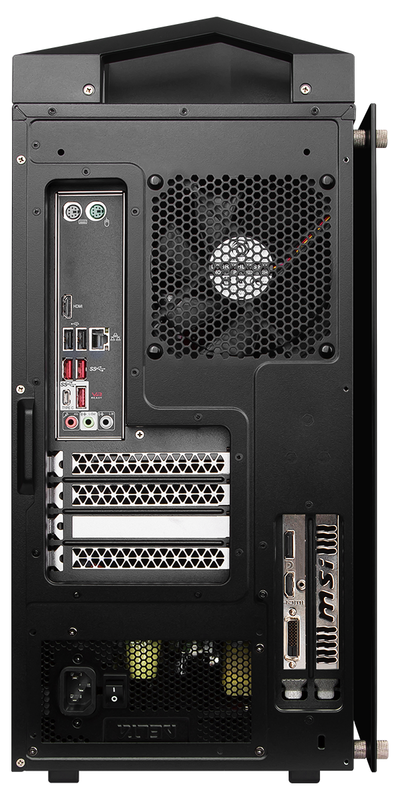 MSI has the PSU, CPU and GPU arranged in separate chambers for superior cooling performance. 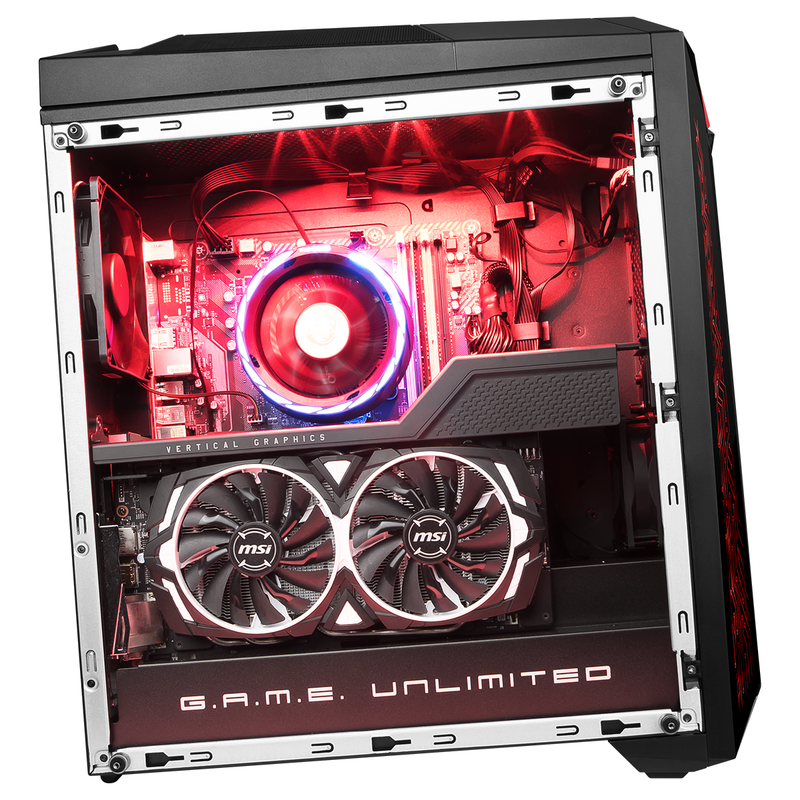 This arrangement, dubbed 'Silent Storm,' sees the stock-clocked Intel chip cooled by an RGB heatsink and fan, while the GTX 1060 graphics card is vertically mounted and outfitted with a tried-and-trusted Twin Frozr VI cooler. We don't imagine temperatures will be a problem, and we're intrigued to see whether MSI can keep noise levels down. End-user upgrades are easy enough - we'd be inclined to stick a second stick of RAM into one of the three empty slots - however cable management could be better. The build is by no means messy, but cabling isn't as tidy as it would be from, say, a boutique system integrator. 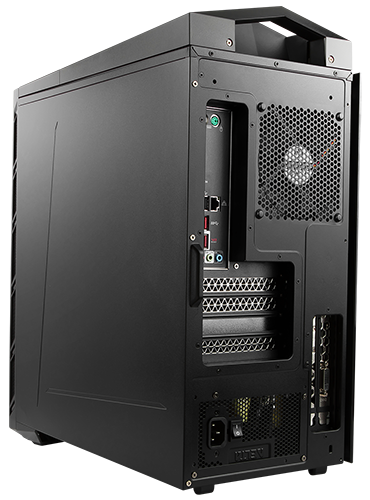 Enthusiast readers will also point out that a similar rig could be built for less money. That's true - we reckon a comparable desktop can be put together for around £300 less - but said enthusiasts tend not to shop at PC World. On the software front, Infinite A 8th is shipped with a 64-bit install of Windows 10. Microsoft's insistence on adding superfluous apps by default is such that there's no such thing as a clean install these days, yet MSI feels the need to expand on that with a handful of in-house utilities and a lengthy list of bloatware that includes the likes of Norton Security, Photo Director 8, and PowerDVD 14. MSI could be doing more to showcase its hardware expertise, but let's take a look at the benchmarks before we pass judgement.